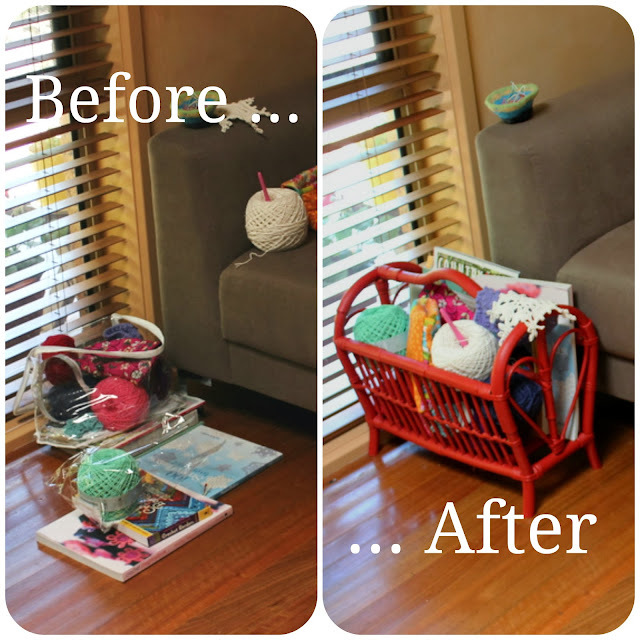 Girls Wear Blue Too: Magazine rack makeover. A few weeks ago I was perusing some of my favourite blogs and Lisa Tilse had posted about how she found, amongst other things, an old bamboo magazine rack on the roadside, out with someone's junk. 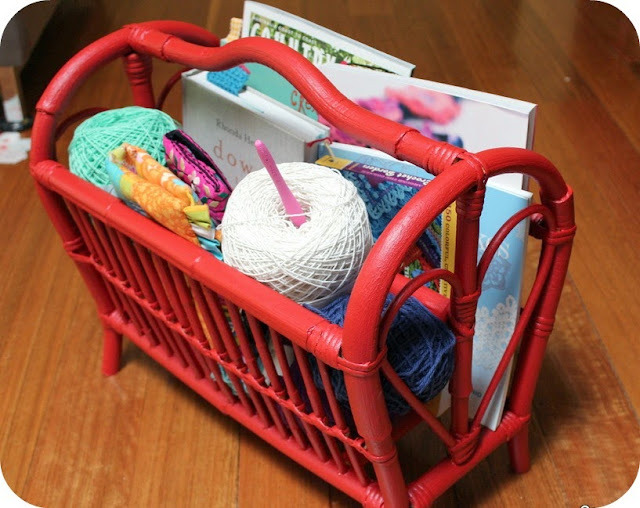 She had painted it up in a stunning shade of turquoise blue and was using it to store yarn and magazines. 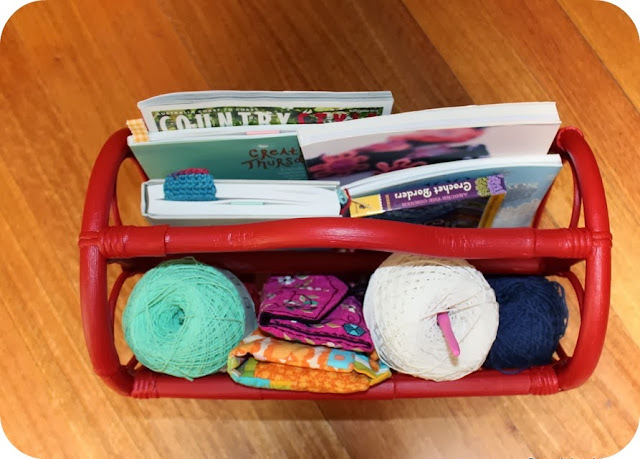 When I saw those big 200g balls of yarn in hers with the crochet Afghan I was lamenting that we don't have roadside collections and how I never have cute finds like that. I have my yarn selections in a plastic bag by my feet and a big pile of books there too. This would be an ideal solution for me. So imagine how my heart leapt when we entered the Salvos store ( op shop ) looking for a table or desk and there, right before my eyes was an almost identical Magazine rack! Of course I forgot to take before photos ... But isn't it lovely now! After one false start with an orange coat. We had this paint in the shed, its the colour of the eldest child's feature wall in his room. Dulux Red Box . I painted it with a brush. It has a base coat of coppersmith which was the lounge room wall colour in our old house, but in this instance it was tonally too close to the original bamboo and looked more dowdy than dazzling, however it did make a good undercoat. Look at the improvement to the space at the foot of my chair! A random little side tip - if you keep your yarn tails in a felted bowl and if you were to knock it flying now and then, they probably wouldn't fall out all over the floor. Just sayin'. I've since seen these on Ebay for between $8 and $20 dollars and spotted a very pretty green painted one for $50.00! I was lucky to be shopping on half price day and picked mine up for $3.00. What do you think? I love that colour, Tammy. Well done. It's amazing what you can pick up at the Op Shops. Our St.Vinnies and one of the Life Line shops are the cheapest in town but some of the others are quite expensive. Great find, nice colour! A nice way to have all the bits and bobs together! Love it Tammy. Anything painted red captures my heart. Must keep a lookout for something similar. My craft and books live in various calico bags at my feet. Have a lovely weekend - hope the school fete is a huge success! Great find, you can always find something great at Salvos stores. Funny that I had been thinking of painting a wooden magazine rack that has been stored in the garage for a while, it's not as wide as yours, but will look great with a coat of colour. Fantastic! What a great find! Love the colour and such a great improvement with the before and after shots!